I've already expressed my addiction and adoration toward planners and how I think they are a necessity. 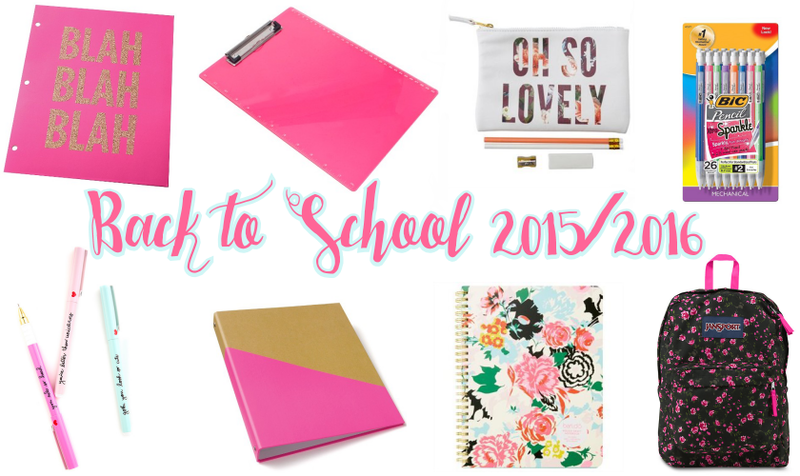 So now, here are a few other pretty supplies that I would not mind carrying to school or having on my desk at home! I always had one per class, plus a few extra report folders at home for when a project was due. Ah, the wonders of a good clipboard. If your school has those really small arm desks that barely hold a book, you'll want the extra support while you take notes. I was stuck in a class or two with one of those during college. Keep your pens, pencils, and other little accessories in a cute case or bag. The bottom of your backpack will thank you! I prefer mechanical pencils unless a Scantron test is involved. And the bigger the pack, the better. You know you're always having to lend one to that friend who forgot theirs. My high school let students take notes in pen, but everything else had to be in pencil. I think pretty pens make a difference. Almost makes you want to whip them out for those long biology notes! For me, I was more of a folder and notebook person. That's just because I rarely went to my locker, so I didn't want to carry multiple binders all day. I did keep my binders at home, though. I'd empty the folder contents when it would get full and add it to its dedicated binder. This double system worked wonders for me. Like with the pens, I think pretty notebooks are worth a splurge. Or buying a cheap one and completely personalizing it. Make it fun to whip out in class and at home when studying. Oh man, I never fell out of love with JanSport. In college, I opted for tote bags but only because most of my classes were an hour or two apart and I'd be able to go back to my dorm in between. But JanSport got me through all of middle school and high school and multiple band trips. And they have like 60 prints to choose from now. This floral one is my personal favorite! Do you still love the back-to-school shopping time like I do?